Sean [AE]: Listening is heavily influenced by computer science and technological advancement in the real world, specifically in the recent development of nanotube technology. How much did you know about the logistics of said thought, experiment, and technology going into the writing and filming of your production? How much more do you know now? Sullins: Yeah, early drafts of the script read like a medical journal. Some people refer to some of the dialogue as “technobabble,” but the scientific logic was always very important to me. 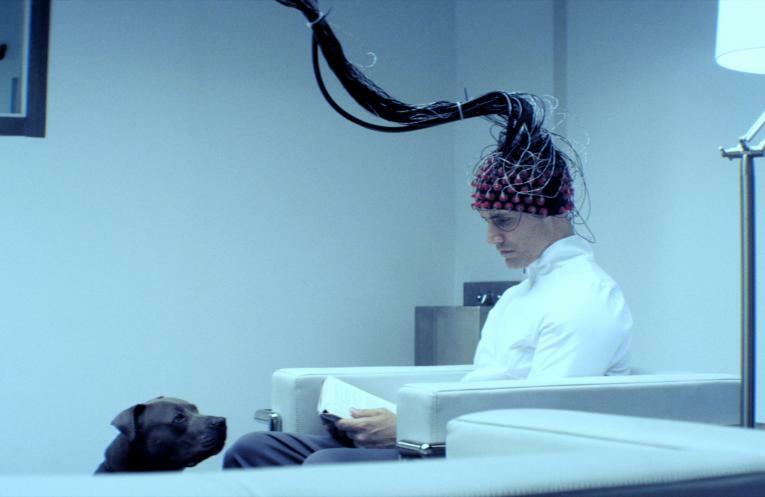 I wanted this to be a “hard sci-fi” movie, [and] now neuroscientists tend to be some of our biggest fans, which is very satisfying. I’ve always been very interested in science but really had no idea how close were were to inventing telepathy when I first started writing the script in 2010, [but] machines do exist out there that can read out thoughts on a very elementary level. The big breakthrough I came up with for the characters in Listening to have was the invention of microscopic nanotube electrodes that could track billions of neurons in the brain, rather than just a few hundred. I based this concept on what I could find online, and what I thought the next step might be, but as far as I knew in 2010, nanotube electrodes didn’t exist. But just after we finished principal photography, I saw an article on MIT Technology Review about the invention of exactly that. Nanotube electrodes now exist out there in the real world, and scientists are trying to get them working in animal and human brains. We kind of joke that we set out to make a sci-fi thriller and ended up with a historical drama. AE: As a genre picture, your movie shares overt thematic tropes with films such as War Games, Primer, and even more recently Ex Machina, but also thrives on a political sub-plot that borders on inclusion beside such AI blockbusters as RoboCop and The Terminator. Where do you see your film within the science-fiction tradition? Or if you don’t, where might you cite its influences? Sullins: I love sci-fi film, but I’m also a big comic book nerd and still read comics more than anything else. I liked the idea of taking the telepathy super-power, and making it as real and believable as I could, similar to the Nolan approach to the Batman character. The tone of the film, and some of the story devices I use, come from superhero comics. David and Ryan actually echo the Batman and Superman archetypes from Frank Miller’s The Dark Knight Returns. [But] those are also great movies you mentioned, [and] I also looked at some great filmmakers first films: Aronofsky’s Pi, Shane Carruth’s Primer, George Lucuas’ THX 1138, and Andrew Niccol’s Gattaca. I also grew up reading Michael Crichton, so he’s probably an influence. Listening might be more of a techno-thriller than true sci-fi. AE: A big part of the film’s plot has to do with reality, specifically in relation to how we perceive our conscious or perhaps subconscious, world, and the power of individual thought on our environment and being. Do you think telepathy and mind-reading affects, distorts, or creates said phenomenon? The rest is only thew and bone. Thoughts might be more “real” than the physical world around us. That’s part of why I liked the idea of making a telepathy film. There is a sub-theme in the film about the dynamic between thought and action, and the necessity of good intentions and good actions for true progress. The characters in the film never line both of those up. Also, the film serves as a metaphor for the world of social media and communication technology in general. We all have filters in our brains. We don’t do or say every little thing that pops in there, but in a world where telepathy exists, you can plug into someone’s unfiltered thoughts. That’s basically what it’s like reading comment threads on YouTube, or some people’s Twitter feeds. Often, there is a lot of negativity out there, and I think that affects our collective reality. For some reason, we feel safe and anonymous behind technology, but everything we are projecting out there is being seen, recorded, and tracked. Listening isn’t an anti-technology film, and it raises more questions than it answers, but it also suggests the need for mindfulness, not just in how we use technology but also in the thought habits we cultivate in the first place. Whatever we spend our time thinking about will manifest its influence on our physical reality. Technology just amplifies our thoughts. It is our mind-space where we have some power to exercise self-control. AE: In your film, the government stands at the center of nanotube development, production, and deployment. Do you think that it’s possible for telepathic, brain-to-brain communication to be used for good, or would it require federal regulation for the protection of private interests? Sullins: I certainly don’t have all the answers, I can tell you that much. But I worry about today just as much as I do the future. So much scientific progress is driven by a desire for profit, and that is pretty scary. Governments and corporations are already tracking everything we do online, either in the name of national security or so they can sell us more products. Mark Zuckerberg, and plenty of others, think we are on a path towards connecting to each other more directly, in a brain-to-brain manner. Technology tends to advance on an exponential scale, which is both awesome and scary. As individuals, it might become increasingly important to search for moral and spiritual truth more actively. AE: Now that you’ve completed your first major film debut, where do you want to go next? Have you exhausted this particular topic, or could you see yourself developing more narrative material out of what you’ve learned over the course of working on this film? Sullins: I’ve got no shortage of movie ideas. I love sci-fi, and might make more sci-fi again in the future at some point, but I’m ready for something new right now. I really admire directors like Stanley Kubrick and Ang Lee who have directed films in multiple genres. AE: As a first time director, what advice would you give to other aspiring filmmakers and screenwriters? Is research fundamental to your process, or do you start with the germ of an idea and craft characters, environments, and cinematic scenes and sequences based on pure inspiration? Sullins: As a director, I was trained in a research-intensive method. You have to understand the subject matter to direct a film. But idea-generation is just as important. I’m sure you’ve heard it before, but creativity is like a muscle and will get stronger with use. I don’t consider myself an expert, by any means, but one piece of advice I might have is this: Spend time every day doing what you actually want to spend your life doing. Any job in the arts or entertainment industry can be tough, so you might as well go for what you’re really passionate about, and spend your time developing that craft. If you spend every day painting houses, you will inevitably gain expertise in painting houses, whether you want to or not. If you want to write, then spend your time writing. If you want to act, then spend your time acting. Persistence and steadfastness. It sounds simple, but that doesn’t mean it’s easy. Developing expertise takes years, not days. AE: What do you hope viewers will take away from watching your film? Do you think they will come away excited by the possibilities as you have introduced them, or terrified for the future of person-to-person communication and their own autonomous free will in such encounters? Sullins: Hopefully people have a good time watching Listening. It’s meant to be fun, but hopefully it starts a conversation about our relationship with communication technology. I don’t condone what David does at the end of the film. We can’t all go out and blow up the internet or just unplug completely. Technology isn’t going away, and that’s a good thing. The world is evolving, and we have to figure out how to live and contribute to an ever-advancing technological civilization. Hopefully, as we learn how to text message better, we also learn how to talk better face-to-face. AE: In terms of inspiration, what directors have influenced you the most as a filmmaker? What screenwriters as a storyteller? What films as an individual? Sullins: Oh man, there are too many to list. I love David Fincher, Christopher Nolan, Stanley Kubrick, Steven Soderbergh, Charlie Kaufman, Martin Scorsese, Spielberg, the Coen Brothers, and on and on and on. I have pretty diverse taste, and my friends tend to make fun of me for liking everything. Growing up, I probably watched the Star Wars and Indiana Jones movies more than anything else. In high school, I loved Fight Club and The Big Lebowski. Now, I get most excited for comic book films, because I grew up with all of these characters. I also love the comics of Brian K. Vaughn, Scott Snyder, Frank Miller, Robert Kirkman, Bill Willingham, and Jonathan Hickman, to name a few. AE: Where do you see independent film going forward? Is it an environment that you see yourself continuing to work within, or would you be interested in courting the interests of a Hollywood studio production? What is your impression of the allure of each camp, if there is in fact a difference between the two? Sullins: A lot of my movie ideas are pretty big budget, so hopefully I get to make those someday. In an ideal world, it’d be great to work in both worlds. It’s great having total creative control, but my imagination tends to run big. Either which way, it would be crazy not to keep making movies after everything I learned on Listening. AE: Are you working on anything right now? Sullins: I’ve got a couple scripts I’m developing. The one on the front burner is a detective thriller that I’m pretty excited about. You can see Listening now in theaters and on VOD.